As new technologies like wearables, 3D printing, self-driving cars, and the Internet of Things emerge out of obscurity and onto the commercial scene, it can be hard to separate the hype from the real business value offered – but Gartner Inc. is here to help with its hype cycle graph. 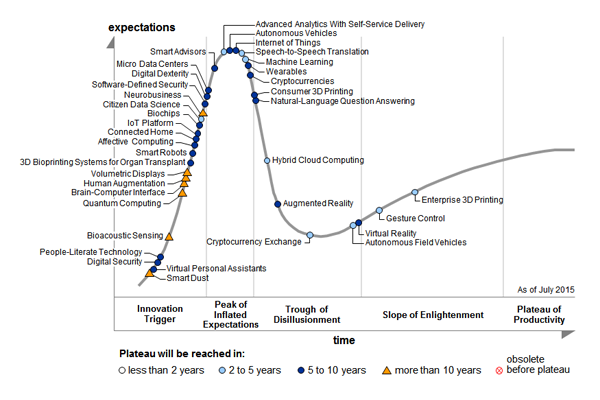 Gartner published its graph and report on the Hype Cycle for Emerging Technologies (2015) on Wednesday. One of several hype cycle reports published by the Stamford, Ct.-based analyst firm, emerging technologies is the longest-running area where Gartner has used this approach. But what do all those blue circles and yellow triangles placed along that sine curve really mean? In recent years of releasing its hype cycle report, Gartner has complemented the hype cycle curve with a maturity rating. Paired together, the indicators can give a business an idea if a technology is right for them to consider adopting. Understand the technology overall. “What I advise clients to do is look at the hype cycles that are interesting to you and read the first four or five pages,” Burton says. From there choose which specific technologies and drill down into those areas, looking at the rating and consider the vendors related to them. Use Gartner’s My Hype Cycle toolkit. It lets you choose technologies of interest to create your own graph. You can use it to look at the relationship between technologies you may want to pursue.